To stay fresh and keep pushing for learning new skills, occasionally it is good to change perspective. Change it radically. How? For example, by entering a new industry. In4Art is a newbie in art. We have not studied it nor worked in the indusrty, but since 2015 we decided it was time to incubate young artists and dedicate our own career to art. Usually artists struggle, have side jobs, can’t make a living out of their sales and wonder how to change that. In art, this is the reality for most aspiring artists and many of them stay struggling for the rest of their lives. 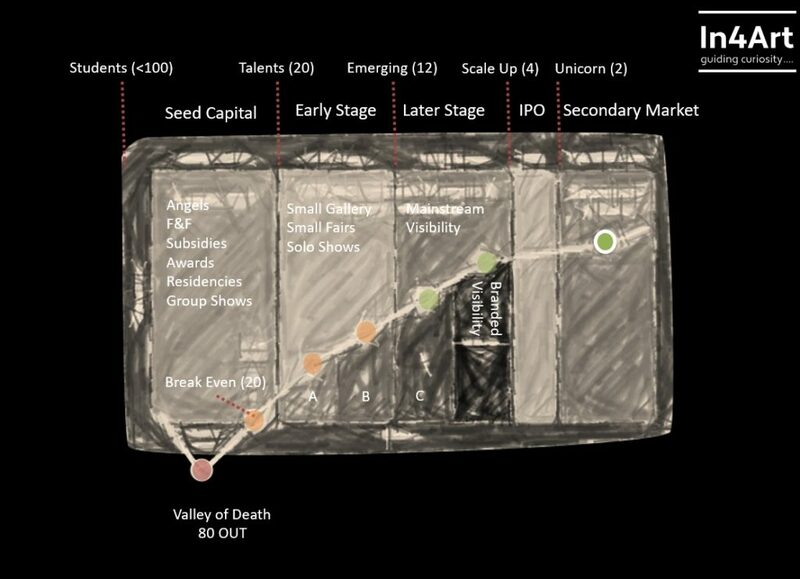 In innovation theory (what I did study) this phenomenon is known as the ‘valley of death’ and it is part of the route to success that every start-up company and every new launched product must go through. The funny thing is, however, that in business the trick is to grow out of this phase as fast as possible or if you don’t, pivot your value proposition. There is no time and certainly no money to stay in the valley of death: the only way is up or fail fast. At In4Art we use our knowledge and experiences from business innovation to guide tomorrows leading artists. They might have great works but if they are not seen, badly marketed, poorly communicated or simply unexplainable they will never become renowned artists. To get out of the valley of death and start growing a career as an artist you should do exactly what start-up entrepreneurs try to do: find people willing to invest. Where to start? As a student, all is well. Your environment is protective, supportive and enthusiastic. You might even sell your first works to family or friends. In start-up world, we call this the 3Fs: family, friends and fools. They are nothing other than positive and admire your drive and creativity. The graduation show is great, so many visitors and so many nice people, maybe even a gallery offers you a place in their annual graduation selection group show. But then it becomes quiet, your work needs more research and depth and you need time to find your style. The art world does not wait and appears to lose interest. You are on your own and have to start thinking how to build a name for yourself. Do you want to be an artist? If so, how are you going to survive? You need Seed Capital. This is the first stage of attracting investors to your practice. They bear the highest risks since you are completely unknown and it is very likely you will not succeed as an artist. Subsidies like the Mondriaan Fonds in the Netherlands are a good source in this period, just like Residencies as the Rijksakademie and submitting work for Awards. Moreover, this is where the Angels enter the game. Business Angels are private investors who invest in promising talent very early on. Apart from the investment, Angels also open their networks and knowledge to help the entrepreneur in every way they can to succeed. In art, it is very uncommon to see Angels but I believe this will change fast. So, you managed to secure a few subsidies, you spend the last year or three at residencies in different countries and you have been shortlisted (or perhaps even won) an award or two. Good for you, you are now crawling out of the valley of death and approaching your Break Even Point, the moment you can live from making art. You have already outperformed 80% of your fellow art students who will fail to get where you already are. Now it is time to start building a name for yourself and securing market share, you are ready to enter the Early Stage Investors arena. This is where, in business, you would be going through several venture ‘rounds’. Making a pitch desk to bring across your story, developing a proposition document and trying to convince investors to step in because you will be growing. In art, the exact same dynamics apply. You might be approached by a small gallery who will take you to a few national fairs and throw in a solo show or two at the gallery. You will be at the openings talking to tons of people ‘pitching’ your art. The gallery will have developed a small brochure to go along with your show (the proposition). At first the gallery will sell to anyone who is willing to buy but once the attention for your work increases a good gallery will start placing works with preselected private collectors or institutions. Your development has not gone unnoticed and you are being referred to as emerging artist. Prices for your work go up, you have now reached the top 10-15% of your generation. But you are not there yet. The gallery might close its doors or fail in applying to fairs over the long term. This could seriously harm your chances to maintain this position. So you have to be entrepreneurial and seek bigger stages to show your work: Later Stage Investment. This is the phase where the stakes grow as people will start investing larger sums of money to develop the practice and networked people will be associating themselves with the name of the artist. These investors have only one thing in mind: the investment should go straight to the top. In business, this is the Initial Public Offering or IPO. This is the moment the company goes public. In art, again, the same dynamics apply. Later stage investors could be bigger, mainstream galleries with representation in multiple countries and access to the biggest, best art fairs in the world like Frieze, Arco or Art Basel (Miami). Also, they have a rolodex with direct phone numbers of directors of leading museums and the biggest private collectors worldwide. Often, they will place the works even before they are made by the artist. Wow… you are now a well-known artist. Your agenda is filled with shows and invitations to work with best institutions and collectors in the world. You are becoming a branded artist and when you look around you will notice that there is only a small 5% of your generation left. You have reached the position where you can decline offers but at the same time many of the buyers of your work are in it for the investment promise and less for the art. Gallerists and collectors will be speculating on the Secondary Market prices for your works. In business terminology, the start-ups who have made it to the secondary market are the unicorns. Think of Facebook, Airbnb or Uber as recent examples. There are only a few per generation who make the cut. In art, this is the same. The ones who end up here are not necessarily better than artists who do not, their breakthrough has ever so much more to do with the people around the artist who have made some smart decisions branding the name. Think of Ai Weiei, Jeff Koons, Damian Hirst as prime examples of the previous generation (born in the 50’s and 60’s). Through times, incubating artists has been done by many different actors such as the church, the noblemen and the industrialists. In4Art wants to become the leading 21st century art incubator guiding tomorrows leading artists and art collectors. And it might be you! This article is based on a talk held November 24th, 2016 on the occasion of Artist’s Angels @Boijmans Fra Bartolommeo. An impression can be seen here.